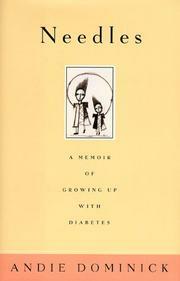 Iowa essayist Dominick’s powerful first book is a harrowingly detailed, compulsively readable memoir of her life as a diabetic. Dominick learned that she had diabetes at the age of nine. She was already familiar with the disease, having observed her college-age sister, Denise, go through her daily regimen of insulin injections and blood-sugar testing. As a child, Dominick would fish Denise’s used needles out of the trash and use then to inject her stuffed animals. She and her brother would use them for water fights and often took syringes to school to show off for the other kids. Once she’s afflicted, though, she has to learn to cope with her schoolmates— teasing and the embarrassment of the occasional insulin reaction or sugar shock. Dominick spares the reader no gritty detail: she graphically describes everything from urine tests to her daily injection in a “painless” area of her arm. Eschewing the doctor’s “rotation” method, she finds the triceps on her left arm hardening until it “looks like an overdeveloped muscle.” She recounts how Denise, as a teenager, would inject peroxide into her pimples. Always her “hero,” Denise died at the age of 33 from diabetic complications and heavy cocaine use. During her own teen years, Dominick would “diet” by not taking her insulin shots, becoming near-comatose from the resulting high sugar levels. Pregnant at 17, she underwent an extremely dangerous abortion. Though she did her best not to allow diabetes to rule her life or dictate her behavior, in her mid-20s Dominick underwent a series of eye operations for diabetic retinopathy, leaving her with “the vision of the old.” After her marriage, she insisted on a tubal ligation because of the dangers of pregnancy and her refusal to pass the disease on to any offspring. The general grimness is relieved by Dominick’s acid wit. Decidedly not for the squeamish.